Saints and Scripture Sunday: Corporal Works of Mercy - The Kennedy Adventures! I talk often of how I feel I’ve been called to be a wife and mother — for the most part, I embrace it whole heartedly. Sometimes, however, I get discouraged by the mundane tasks of marriage and motherhood. I need to ‘keep it simple’, and remember that imitating Christ begins at home. Instead of complaining inside, about the drudgery of my household tasks, I need to focus on these corporal works of mercy. Feeding my children and husband, packing sippy cups for a road trip, dressing my sweet babies after a bath, and taking care of my sick baby boy somehow mean so much more after reflecting on this passage. 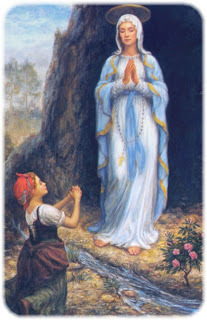 In 1858, Mary appeared to Bernadette Soubirous, a peasant girl, outside Lourdes, France. She revealed herself to be the Immaculate Conception, and asked that a chapel be built there in her honor. A spring that arose there still flows today, and the waters have been thought to have healing powers. Lourdes is the most famous modern shrine to Our Lady today, with over 5 million visitors each year. Link up, join in, and share some of your favorite Saints and Scripture. We’re heading into Lent, so stay tuned! Sometimes when we think of corporal works of mercy, we think of the extraordinary stuff to do out in the world. I like the reminder that it applies to the sippy cups and the perpetual dishwasher, meals and snacks and requests for drinks when they’re supposed to be sleeping, the mountain of laundry… the special care when they’re sick. Nice post!